Edo State Governor, Mr. Godwin Obaseki, has said that the state government will harness the sporting talent in the state as a tool for youth empowerment and economic diversification. Minister of Youth and Sports Development, Solomon Dalung (left), presenting a souvenir to Edo State Governor, Mr. Godwin Obaseki, during the minister’s courtesy visit to the governor at Government House in Benin City, Edo State capital. The governor said this while delivering his welcome address at the Extra-ordinary Meeting of the National Council on Sports, in Benin City, the Edo State capital. 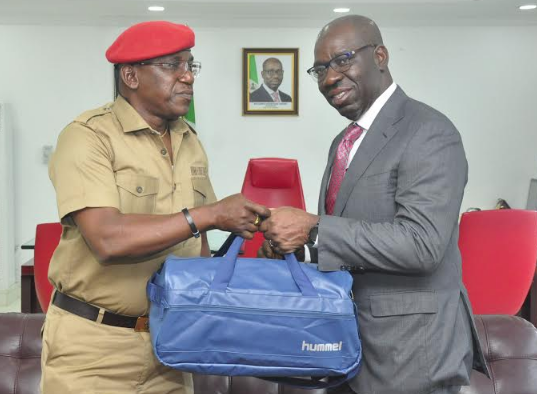 He said that Edo State is reputed for putting up superlative performance in sports which was reaffirmed during the 19th National Sports Festival (NSF) held in Abuja last year. He said that after the state government got the hosting right for the National Sports Festival, the scope of work at the Samuel Ogbemudia Stadium was expanded, adding that the state government has streamlined her security architecture to ensure visitors, who will be in the state for the Sports Festival are secure and safe during their stay.